Before we get started with this review of The Lego Ninjago Movie let me say up front that I am unfamiliar with this part of the Lego brand. My son is a huge Lego fan but he was never into Ninjago, the toy or the show. So I’ll be coming at this without knowledge of the world or characters involved. Whether that is a good thing or not I’ll leave to those who are already fans of the franchise. Lloyd seems to be a typical teenager, but he stands out in two ways. Firstly, his estranged father is a super-villain whose goal is to take over the world of Ninjago — making Lloyd a pariah among his peers. 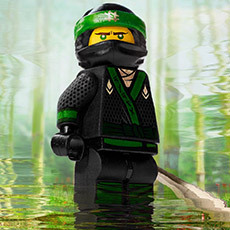 And secondly, he is secretly the leader of a much beloved group of ninjas whose job is to stop the evil Garmadon. In short, he has some serious daddy issues. The Lego movies have all had an interesting thread running through them — kids dealing with their parents. In the original film it was a kid trying to make a connection with an over-worked and over-controlling dad. In the Batman movie it was a grown child afraid to let people into his life after the loss of his parents. Here, the main character longs for an admission from a father who was never in his life that maybe he wishes he had done things differently. But while the other films in the series handled these themes with varying degrees of success, The Lego Ninjago Movie fails with a heavy handed approach. Characters all but stop and look at the “camera” as they say exactly what they’re feeling and thinking and what it all means. And then they do so again… and again! It makes the whole thing feel more like a movie aimed at preschoolers who don’t get subtext — like Dora the Explorer telling us what she needs then repeating it over and over. But who are we kidding? 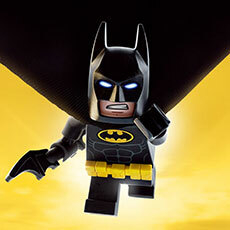 The star of Lego movies is the humor. Unfortunately, there’s a step down from the previous films in this department as well. Where the other films had laughs that came almost too often and too fast, the jokes here are fewer and further apart. Note that I’m not saying the humor falls flat. Just that there is less of it than in previous outings. When the writers do bring the jokes they almost always succeed. But if you’re expecting non-stop funny, you’re going to be disappointed. 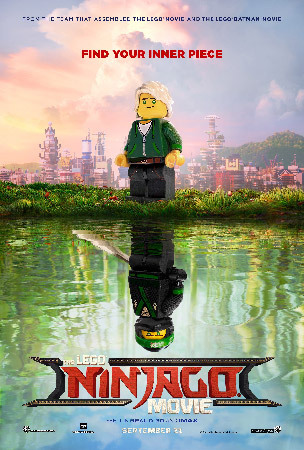 The plot is a bit more by-the-numbers in Ninjago than I’d like, especially comparing it to the last two films. Other than one out-of-nowhere development I refuse to spoil here that works to perfection, the rest of the story is predictable to anyone who is over 12 years old. While it’s still an enjoyable enough ride, it lacks a lot of the wacky spontaneity that made The Lego Movie and The Lego Batman Movie so memorable. Though I would like to call out the framing device for special note. That was well done, fun, and a good way to get us into the film. As I said at the start, I’m in the dark about the Ninjago world. I don’t even know if the characters in this movie are original or brought in from previous building sets or the series. So I can only judge on what I see here. Lloyd is an extremely fun character, and nicely voiced by Dave Franco. He reminded me a lot of Emmet from the first film, a character I adored. Though his kind of forced overly-hip/cocky style of speaking did start grating on me near the end! Garmadon was maybe the best part of the movie, over-the-top evil but braggadocios, and hilariously voiced by Justin Theroux. 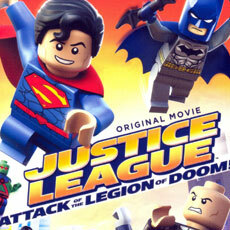 My only complaint would be that Lego villains are beginning to seem a little one-note. Jackie Chan was fun as Master Wu but didn’t get a lot to do. 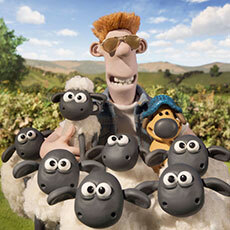 As for the rest of the characters in the film? That’s an issue. They were all but forgettable. I literally can not remember any of their names or who voiced them. (Thank goodness for IMDb!) Zane was probably one of my favorites in the supporting cast, but the writers just did not do right in this regard. There are five other ninjas in Lloyd’s group who appear with him in most of the film. I assume they each get more to do the TV series. But here other than the fact they wear different colors and have different elemental powers, they are all but interchangeable plot wise. 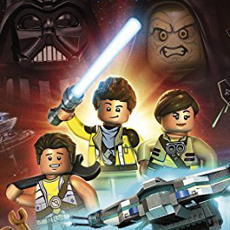 The animation is top quality and the artists have obviously had a ball adding in lots of fun touches that the Lego films are known for. Like the Batman movie before it, Ninjago does a great job of using the themes and stylings of the genre to differentiate the film from the other films they create. And kids will love the insane action sequences with the mechs. 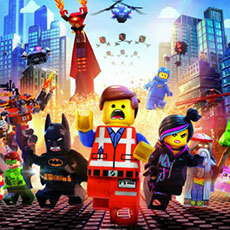 Music has always been integral in Lego movies. Ninjago’s music, both original and otherwise, is fitting and fun. But not as important to the story. And in this outing I don’t see that as a bad thing. I think it would have felt forced in this world, so the little we got is probably just the right amount. The Lego Ninjago Movie is enjoyable but not at all awesome. It feels geared to the younger set, which is not a bad thing — they’re going to love it! But it is a bit of a disappointment after two films that were able to straddle young and older audiences. I don’t think the Lego movie franchise is in any trouble since the issues here may have had more to do with the subject matter. And maybe it isn’t fair to compare this one to the previous two that share nothing in common but the bricks. But while there is some fun to be had, it’s hard to spin this as anything else but a letdown.